The hilly spins are surely at an end now as tired bodies wind down for the autumn / winter season. Another great group spin this week! 26 happy bikers. Here’s the group PRO report: G3 had another marvellous turnout on Sunday with 26 riders on what was a beautiful autumnal morning. Captain Anthony managed to add a diverse twist to a fairly regular winter route and we were all curious as to what lay ahead. First off though it was up to Colligan turning left at Ballinamult and joining back up with the Millstreet road. Back on the main road it was onwards to Cappoquin turning left for the Dromana drive. Lovely to meet albeit briefly G5, G1 and G2 enroute. At Aglish it was on to the first of the new climbs the Shan Hill which is a long enough drag to Clashmore. Next up the tougher Naomh Mochua Climb out of Clashmore. The visual of the sun beaming down on Youghal bay made it worth the effort. The wind had picked up substantially at this point but thankfully the rain never materialized. Across to Ardmore, followed by a windy descent down the Sweep and all back safely. The hilly spins are surely at an end now as tired bodies wind down for the autumn / winter season. 26 in group, 800m of climbing, 27k avg. I had heard of Hickey’s Cross, and after today I know where it is. Also today, after seventeen years of cycling, I ventured on a virgin road just 20km from me. Never been up those hills before. Nice route and spectacular scenery on the descent towards Youghal Bridge. It was a big mileage week, so perhaps time to chill out before heading to the sunshine of Alcúdia. Riders who joined the group during the spring are very strong. Coffee at end of a spin is second only to mid-spin, but coffee nonetheless! Because I cycled slowly to the start, and also finished slowly after coffee here’s a link to a cropped version of the spin. Average 23kmph. 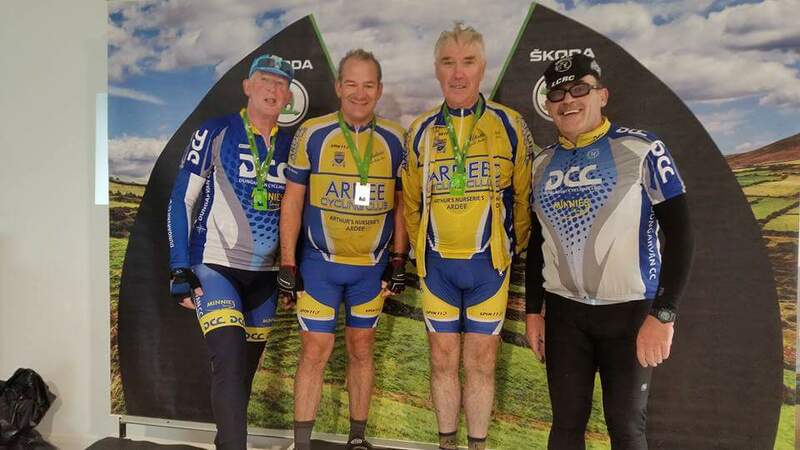 Footnote: Carol B is the PRO for Group 3 Dungarvan Cycling Club. More importantly she is a fine cyclist. 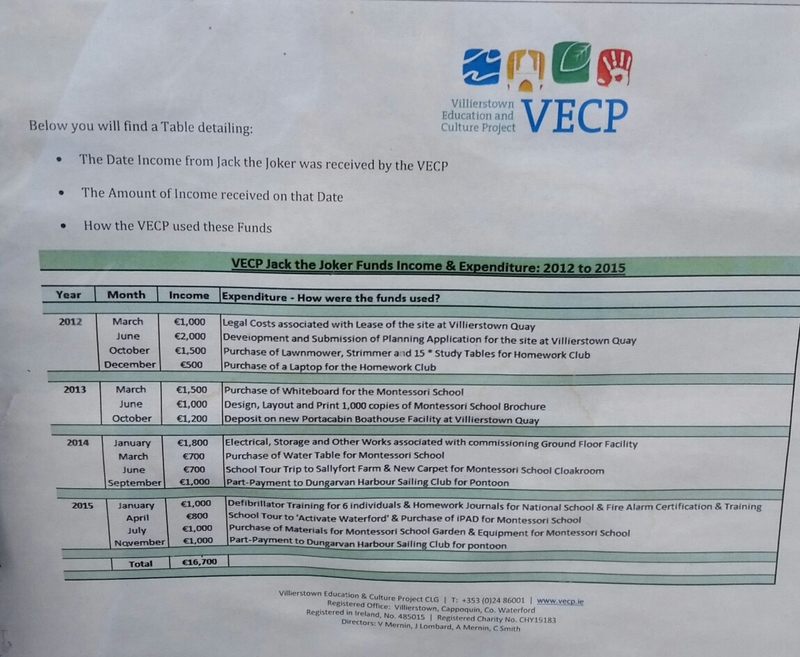 Attached to the wall between the shop and the Montessori playschool, there was a defibrillator, and within the accounts it was stated that funding was provided for training of six persons. This is great for a small community. 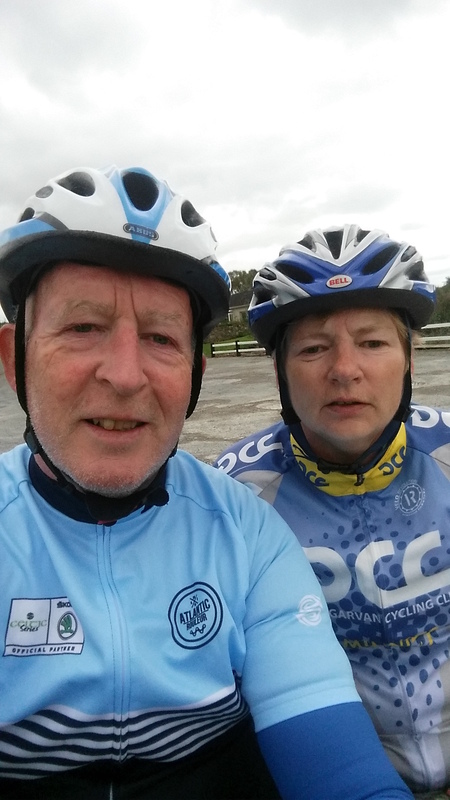 Today I cycled with Marion to Villierstown and we stopped in for coffee at the shop. While sitting outside, my attention was drawn to the many notices in the window. Villierstown, it seems, has a thriving community spirit. There was a notice outlining the library opening hours. There was one about local crafts, and yet another about Villierstown Education and Culture Project. I lingered on this one, and found it most interesting. The directors of this charity are named, and are locals. Furthermore, attached was a set of running accounts relating to monies raised. It made very interesting reading. The funds have been allocated in many directions, as can be seen below. My bike knows the way to Villierstown by default. It’s a place I love to visit, and I like to sit and not be in a hurry to leave. I wrote about one such visit back in May, and likely I will be keen to return regularly during the autumn and winter. One of the loveliest spots is about a kilometre outside the village, down at the quay beside the river Blackwater. The river is tidal to here and further up to Cappoquin. The view upriver with the Knockmealdowns on the horizon is very special. There’s a calmness and quietness about the place. We all have families to return to. We have things to do and places to be the following morning. We live in fragile bodies, and things can change utterly in an instant. I met with captain Murphy in Droheda. I had been promising this man that we would cycle together again. This promise has been on the back burner since our Endurance Challenge back in August 2014. 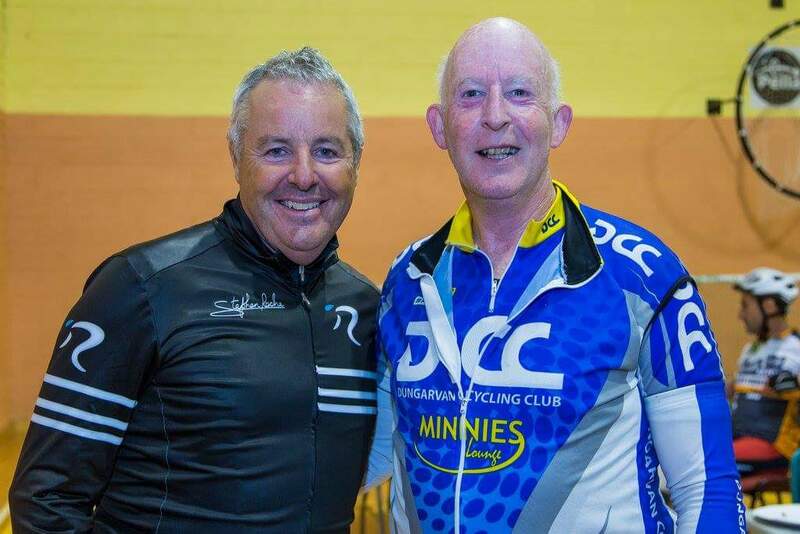 So, when I got an reminder from Skoda about the Boyne Valley Classic I saw it as our opportunity to reunite. Registration and pasta on Saturday. Plans were made, online entries sorted, and I headed to the Wee County with my friends Anne, Mike and Declan to meet up with Tony and another of our 2014 colleagues, Eugene. Unfortunately, the day turned wet, and later on it turned miserably wet. 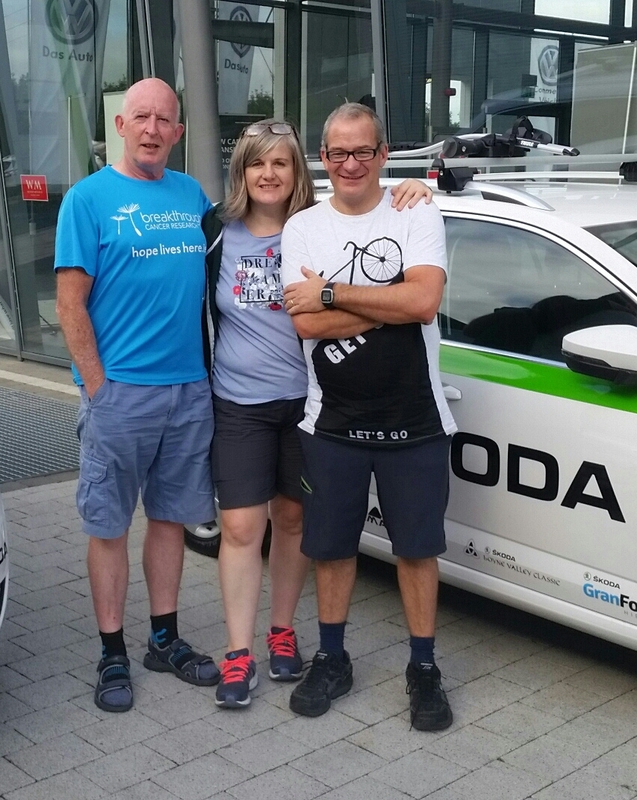 We took the decision to abandon the 150k route in favour of the 100k, and after the rainsoaked sportive we returned to Skoda Motors in Droheda worse than drowned rats. That said, we did enjoy the route and the good spin together. No complaints there. We did complain amongst ourselves about the setup at the foodstop, where 5 (willing) volunteers attempted to serve nearly 500 from a single hatch. It was slow, painful and uncoordinated. 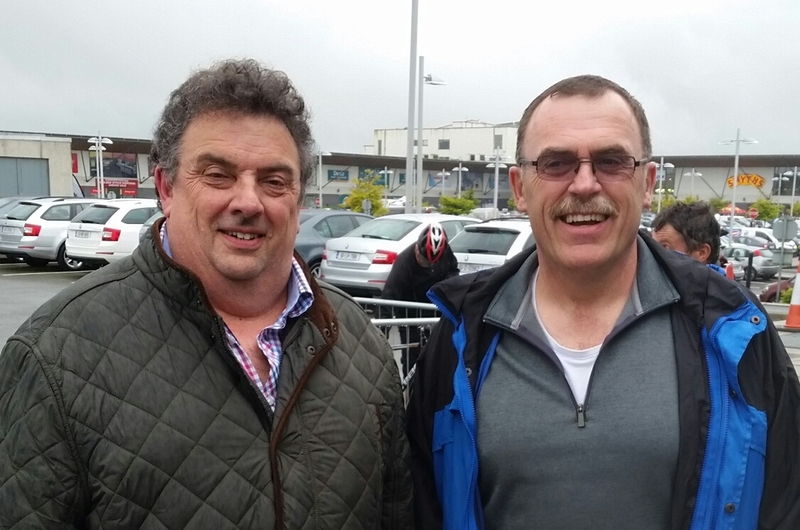 The miracle at Collon it definitely was not! Jesus worked his first miracle at Cana, and they could have done with a bit of his help today. But, in fairness, this is the first year of this Boyne Valley Classic, and it’s very likely that this issue will be fixed for 2017. We were somewhat lucky because we completed the first half at a brisk 30kph average and arrived in Collon towards the top of the queue. As we left twenty minutes later, we were saddened to see many cyclists standing in a line stretching out into the rain. We got into a very well-organised front from Newcastle, County Down. Shimna Wheelers, take a bow! We loved Droheda, especially d’Vine Bistro & Tapas Bar on Dyer Street. How can I move from the specific to the general? What something might be worth writing about in general cycling terms? In this case, it’s a no-brainer. Safety in a big bunch is top of my feed after today. There was one very nasty looking accident just ahead of us at 35 kilometres. I counted four on the deck or picking themselves up gingerly. Luckily for us, it happened within a group about thirty metres ahead of us. There was a gap, and the frantic shouts from the head of our group gave us time to come to a safe stop. It could have been very different, because our large group were clipping along at a fast pace and passing many groups. We would have been ready to pass the group ahead within a twenty to thirty seconds, and likely the number of fallers would have been higher. Based on the above, caution was to be advised. Certainly, no one was reckless and potholes were called. Riders were respectful and they understood usual group etiquette. But it’s very different from riding a local Sunday spin with one’s local club. Upon coming to a halt behind the unfortunate accident, it was apparent that no one was seriously hurt. A few bruised bodies and bikes; so we proceeded towards the fateful foodstop at Collon, just a bit quieter within ourselves. With that, I think I should return to my focus on the bright side. We enjoyed the event, despite the major organisational flaws. The rain stopped shortly after we finished. Our friend Anne was singled out for a Skoda event interview, because she had completed all three during the year. Immediately, we journeyed speedily from Droheda towards Dungarvan, and strong sunshine broke through at Leamybrien. Footnote: I have been asked why do I write of such events? Primarily, it’s for myself, to remember the details of the day. I suppose also, I like to think that somewhere within these reminiscences, someone else may be encouraged to participate in events such as these. And that’s the beauty of cycling. You get to see all these lovely lovely lovely places. I have enjoyed it immensely. What will you set your mind to achieve? Whatever it is, do what you must to get it done, and do not be deterred by misfortunate days. They are the testers.